Hi, I'm Lisa Tyler, and we're here today from the National Restaurant Show in Chicago 2017, and we're going to be talking today with Mike Kellaz. Mike has been in this industry for 27 years. He is absolutely an expert when it comes to the differences between enamel coated cookware and induction aluminum cookware. Mike? Hi Lisa, thanks for having me. Tell me why am I seeing such a trend now in this cast aluminum cookware everywhere? Yeah, you're right, Lisa. 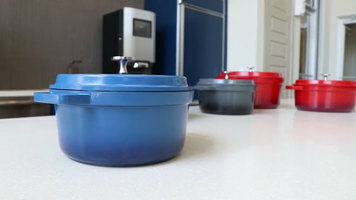 The colorful cookware being used today, whether it be cast iron or cast aluminum is becoming very popular, whether it's for open kitchens or display cooking. It is a trend that is going to be hot for a long, long time. So tell me Mike, why do I want to use a cast induction versus a cast iron? What are my benefits? Okay, there's a lot, and there's some similarities. And it's a great question. So, cast iron - I could never pick up the pan with one hand. It's lightweight. This is our cast aluminum, making it must lighter than cast iron. What we've done, Lisa, is we have applied an induction bottom to the bottom the pan, making this pan induction ready. The beauty of our induction pan is that with the induction bottom, the sides heat up evenly, as well, just like on cast iron. So with this being induction, can I also use this on an open flame? Can I use this in a combi oven? Am I limited in my heating services? Okay, no you're not. In fact, you can use this in an oven. So, open flame, electric, induction - it's all very well suited for our cast aluminum pan. Some other differences between the cast aluminum versus the cast iron pans... yes, the cast iron pans are much heavier. There are differences in terms of how you use our pan versus a cast iron pan from some of our competitors that are out there. The cast aluminum pan is best suited for where you're heating up food and bringing it to the front of the house quickly. If you want to have food presented and staying at the display table permanently, use a cast iron pan, because you're not heating up and cooling down, heating up and cooling down. You're keeping the pan at a constant temperature, and once cast iron is heated up, it will stay hot longer. Do I have the ability to stack these, Mike? That's a great question too, and on cast iron pans - what we've learned during our testing is that often, the cast iron pans will chip around the edges. And that's not because of the use of utensils on the pan; it's because the weight of cast iron pans are so heavy, that once one is stacked on top of the other, they tend to chip around the edges. While our lighter-weight, cast aluminum pans just don't do that. Mike, am I allowed to use these in a commercial dishwasher? Yes. You can use these pans in either a high temp or a low temp environment. And what about a soaking sink? Am I able to do that? Absolutely. When we talk about cast aluminum versus a cast iron pan, and we're looking at our new Heiss line, tell me - what kind of a cost difference am I looking at here? Okay, there's a significant savings. There's a savings in 2 ways. A) Your upfront cost will be less - significantly less. And contact your dealer for your best pricing. Thanks for being with us today. I really appreciate the information - very educational. Thank you. It's been a pleasure. And please, check out your GET blog for more information about cast aluminum cookware, as well as many other GET products. From cost to durability to application, there are several important things to consider when choosing between enamel cast iron and cast aluminum cookware. Learn about these differences with GET Enterprises. 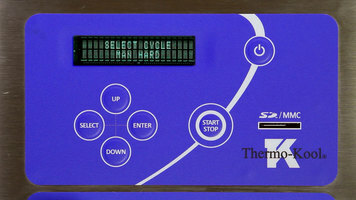 Get the most out of your Thermo-Kool blast chiller's manual hard chill feature with this informative video! Use this programming function to chill dense dishes including lasagna, meatloaf, and casseroles. 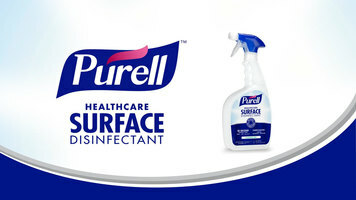 Ideal for hospitals and other healthcare facilities, the new Purell surface disinfectant is a powerful cleaning formula designed to kill 27 critical organisms that can make people sick. With no harsh fumes or chemicals, this cleaner is just what you need at your establishment!